Did you see the solar eclipse in the U.S. last August? If you’re eager to see another eclipse, you’re in luck. We can see the first part of a total lunar eclipse from the Western Slope during the pre-dawn hours of Wednesday, January 31. A lunar eclipse happens when the Moon moves through the shadow of the Earth that is cast by the Sun. This can only occur when the Moon is exactly opposite the Sun in our sky. That is, at times of full Moon. So, why don’t we have a lunar eclipse every full Moon? It turns out that the Moon’s orbit around the Earth is tilted by about 5 degrees from the Earth’s orbit around the Sun. So, at most full Moons, the Moon passes a bit north or south of Earth’s Shadow. The January 31 eclipse starts when the Moon enters the Earth’s lighter, penumbral shadow at 3:51 a.m. MST. You may not even notice this at first, but after about 4:30 a.m., you’ll see some distinct shading on the eastern part of the Moon. The real action starts at 4:48 a.m. when the eastern edge of the Moon will enter the dark, umbral shadow of the Earth. Bright moonlight will steadily diminish until 5:52 a.m. when the entire Moon will be within Earth’s umbra, and the eclipse becomes total. The Moon will then glow with a dusky, reddish light. The reddish color is from scattered sunlight that has passed through Earth’s atmosphere. During totality we are seeing the Moon weakly illuminated by light from countless sunrises and sunsets all around the Earth. 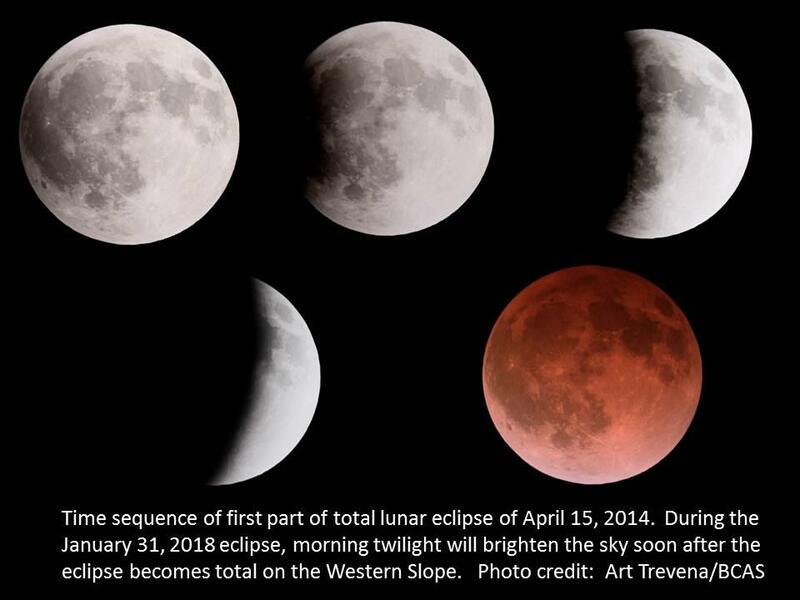 On the Western Slope, it’s best to view the January 31 total lunar eclipse soon after 5:52 a.m., before the Moon sinks lower during brightening twilight. Another total lunar eclipse will be visible from the Western Slope on the night of January 20-21st, 2019. But, consider this: If you could get to the Moon on January 31, 2018, you would see a total eclipse of the Sun by the Earth! Now, how cool would that be?! Western Slope Skies is produced by members of the Black Canyon Astronomical Society. This episode was written and recorded by Art Trevena.